Australian Writings is rated 3.2/10 which is below average. Detected issues: fake official registry, high prices, poor support and referencing. Australian Writings claims it’s working for 16 years on offering assignment writing help to students, not only in Australia but the world over, but it’s not possible to verify. For a start there is no company called Australian Writings Pty Ltd in registry of Australian companies, so the official company name is probably fake and does not exist. They’ve chosen a .com domain name in order to advertise the fact that they can help any student, no matter where they are based. Have their claim of experience given them the edge on the other custom writing services out there? We aim to find out in this review. Australianwritings.com says they offer a varied range of academic texts they can write, including book reports, essays, and dissertations. There’s even an option to have them write just a section of your dissertation, so if your abstract is giving you trouble, you can send it to them and get on with the rest of your work. However, many writing services are diversifying into offering assistance with homework, essay planning, and tutorials, which it seems Australian Writings isn’t doing at the moment. There are plenty of reviews on the site’s page that are four or five stars, asserting that the customers got good marks on their assignments and that they were delivered on time. There are plenty of samples available too, so you can check out their style and see if they’re legit before you order. However, what worries us is that in the samples, there’s no referencing of the facts quoted in the text. If they were handed in as assignments at any university, red flags would go up straight away as it’s a marker of plagiarism. AustralianWritings offers a pricing calculator, which is a bonus as many academic writing services don’t seem to see fit to offer this service. However, the issue with their pricing is that it appears to be so high. 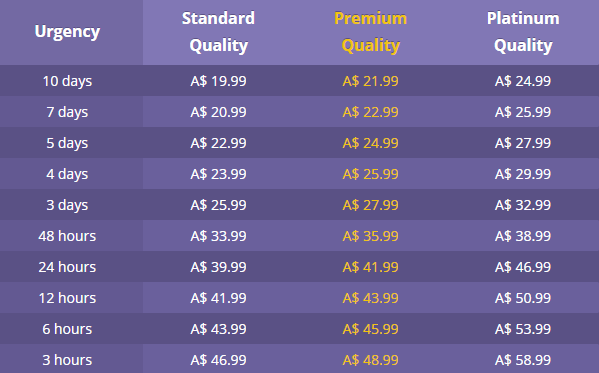 For a 10 page essay, they charge $199.90 for standard quality, $219.90 for premium, and $249.90 for platinum. You sooner you need the assignment, the higher those prices go up. Having seen the quality of the work on offer, those prices are honestly too high. There are coupon and discount codes, such as the 20% off a first order discount, which does mitigate the pricing somewhat. The testimonies on Australian Writings’ site state that many people have had issues communicating with their writers while they were waiting for the work. The customers always did get their work on time, but when you’re waiting there’s nothing worse than being left dangling with no communication at all. If you do need support though, there’s a live chat and phone number so you can keep in touch. There are several issues with AustralianWritings. The high prices, lack of communication, and lack of referencing are all problems that any student will really want to avoid. The fact that they claim to be an officially registered business while it’s easy to verify that they are not is also putting every customer at risk using this website. If you’re looking for a better alternative, try top rated services known for high quality assignments for Australian students, written for reasonable prices and in good time for your hand in date. If you’re in a tight spot, they’re the ones to call. paid for standard quality, had a very weak result, came back later for another paper and paid for premium this time, again very poor writing. switching to something else now. I’ve been using this one few times. Some papers were garbage, some were ok, but nothing really exceptional. Now there are better services to order from. it’s better to avoid this site!! The worst writing service I have ever seen. Got a 5/50 mark and failed the unit. That says it all. Don’t use this service, unless yo want to fail your subject. Hey! Would you mind if I share your blog with my twitter group of students? There’s a lot of folks that I think would really appreciate all the reviews! DO NOT USE this service. Australianwritings.com is terrible. Please believe me when i tell you this company had very low quality writers and VERY BAD customer service. There is little communication. My order took an additional 5 days to be completed (which they didn’t refund me for or even apologise).. Then they charged my card with an extra fee!!! When the order came it was completely wrong 🙁 The standard of English was absolutely atrocious. I paid alot of money for the worst service i have ever received. There are far better places out there folks.. DO NO USE Australianwritings.com. EVER!! I’ve been using australianwritings.com before and they’re not that great. For one of my assignment, the writer couldn’t complete it on time despite I’ve extended the deadline for him twice. By the time I get the assignment from him, it was completely wrong and needed revision. By the revision deadline, the writer is no where to be found and the site support couldn’t contact the writer either so they have to allocate another writer to complete my assignment. I literally had 1hr to review before I have to submit it in. I got an assignment for a first year subject and paid extra for a premium quality. It didn’t receive a pass mark and the author didn’t follow the instructions I gave. They actually didn’t even do the right format assignment and I had to have it revised which meant it wasn’t prepared by the due date. I paid for an assignment – premium quality – one of their best top ten writers. Well let me tell you that what I received was absolute rubbish. It jumped all over the place and the writer just repeated whole sentences and words. I ended up doing the essay myself and paid $90.00 + for the privilege. There was no way in hell that I was going to pass with the piece of rubbish that that gave me. Stay well away from this site. Currently in the process of trying to get my order completed after giving them OVER 30+ hours extended deadline. Mind you its already a day after i needed to submit. First when it was getting close to the initial deadline they assured me it would be completed. having gone through the same reassurance another 4 times they are still asking for more time!! I have used them before and although the quality isn’t the greatest i still managed to pass however this time something has changed and their service is appalling. I have also paid for their “top ten writers” which is absolute bullsh*t and just a ploy to get more money out of you. The quality did not change one bit and the english and sentences don’t always make sense so you need to do a good review. Overall has been a stressful & frustrating experience and i regret ever spending $1 with them. it’s a shame you can’t post a proper review on the business for more people to see!